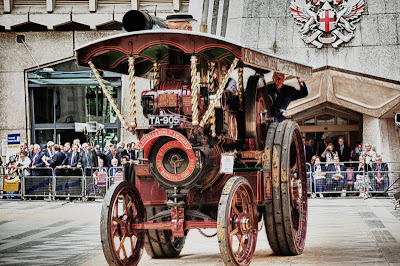 A centuries old tradition that still takes place each year at Guildhall. The marking of the carts goes back to the days when the cartmen sought protection for their trades within the city. This was granted to them in return for keeping the streets clean. Animal dung and rubbish were a big problem, not to mention the night pots. The license is authorise by a branding iron on a wooden plate in the form of a letter. T this year. Among those in yesterday's ceremony was this rather grand steam tractor. Very interesting post! Never heard of "marking the carts"... Love your blog MO - I'm always learning something new here. Happy Thursday! so how many old carts were marked? I love coming across old transport in london, it feels like history comes alive. Every day I learn new things by reading these blogs. I agree with Jack, there's always something to learn about going through all the photo blogs.